Data Center Networking Market size was estimated at over USD 14 billion in 2017 and is predicted to grow at 14.3% CAGR from 2018 to 2024. 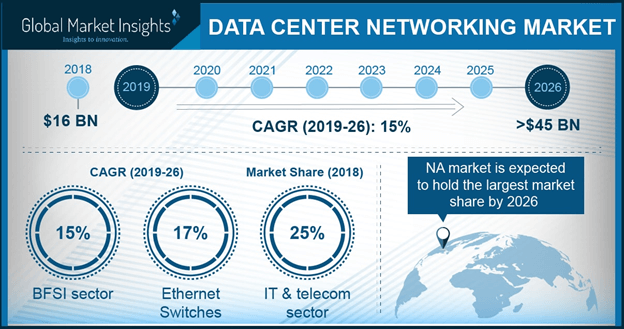 The data center networking market is projected to exhibit a significant growth potential during the forecast timeframe owing to the increase in data traffic and rise in construction and modernization activities of these facilities situated across the world. Organizational and consumer data virtualization has led to organizations operating in various sectors to increasingly become more dependent on these systems. The rising trend of data and network virtualization are increasingly being adopted by companies to drive down their capital and operational expenditure. This combines hardware and software resources into a single entity, which works smoothly and efficiently to accomplish the set tasks, allowing for faster delivery of apps, catering to customer requests, and improved security. The management of virtualized systems requires skilled professionals owing to which the companies are increasingly outsourcing these activities to licensed third-party entities, proving to be a major driver for the data center networking market growth. The high initial costs of setting up production and the presence of a large number of players active in the market are hindering growth. The production of these technologies requires automated systems that can place very small components such as chipsets with high precision and at high speed. Robotic arms can be used in the assembly of hardware devices such as servers and cables but can cost upwards of USD 20,000. The provision of networking services such as installation & repairs and the design of advanced networking technologies including ADCs require skilled labor, further increasing the overall total costs incurred by the end users. Advanced technologies, such as silicon photonics, are generating opportunities for the market. It provides inexpensive, mass-produced, and optical components through photonics integration. This technology enables low space consumption as a single chip supporting 100Gb/s transmission is sized significantly lower than the optical sub-assemblies they replace, thereby lowering the cost and power consumption and improving the density, revolutionizing the data center networking market. The solutions in the data center networking market generated significant revenue of over USD 10 billion in 2017. Network infrastructures house a large number of components such as servers, cables, Ethernet switches, and routers and as the size and demand for these facilities are anticipated to grow, the demand for the hardware is anticipated to increase. Additionally, the growing demand for increased bandwidth owing to an increase in colocation and data centers separated by large geographical distances from the users will hasten the adoption of 100 Gbps interconnects, fueling the growth of the Ethernet switches sub-segment. The services segment of the market is projected to witness a comparatively higher growth of over 15% percent from 2018 to 2024 as there is an increase in the demand for managed activities such as repair and maintenance to skilled third-party personnel having in-depth knowledge as opposed to a company appointing an in-house team. This provide substantial savings to the company as there is lower spending of valuable resources such as labor and monetary funds which can be appointed for other key business operations such as product marketing and R&D activities. 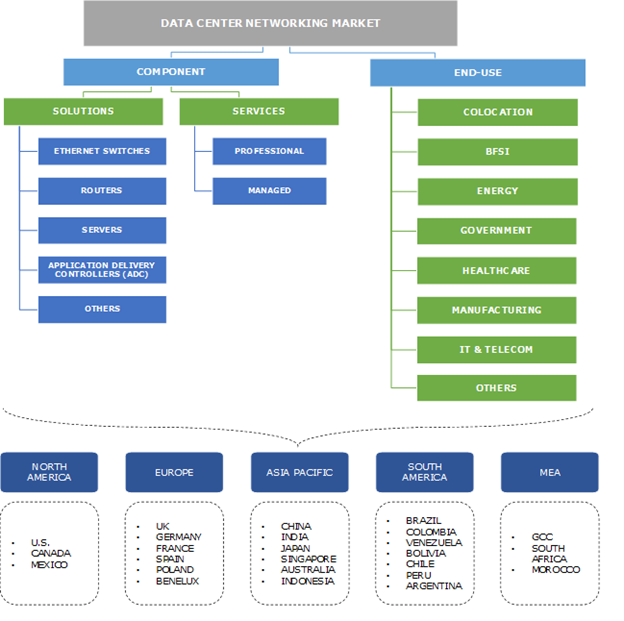 The data center networking market by end use indicates that the IT & telecom sector are prime users of the technology, which is expected to be valued over 9.5 billion by 2024. Large-scale construction activities by companies such as Amazon and NTT Communications have contributed to this heavy demand. For instance, NTT Communications has invested USD 160 million in the construction of data centers in India. The colocation sector in the market is anticipated to exhibit the highest growth of nearly 16% during the forecast timeframe. Colocation is gaining popularity for organizations looking to reduce the expenses associated with maintaining and building data centers. Colocation facilities provide server security, storage, cooling, power, and networking equipment. Constructing new facilities also drains the company’s money, time, and labor, further driving growth. The improvement in the broadband infrastructure in countries including India and China is contributing to the high proliferation of market in the Asia Pacific region, which is expected to over USD 8 billion by 2024. For instance, the Indian government is launching initiatives for improving the internet connectivity in remote and underserved locations across the country. Additionally, the region also accounts for an abundance of skilled labor, low-cost raw materials, and substituent components such as semiconductor chips, leading to an increase in players manufacturing these products. The U.S. and Canada data center networking market hold the largest market share of nearly 40% in 2017 and are exhibiting strong movement toward cloud technologies supported by fast internet speeds and the rising popularity of social media and streaming devices. In April 2017, IBM Corporation announced that the company has launched four new cloud data centers in the U.S. with an aim to support the growing demand for cognitive capabilities. The movement toward the cloud requires the replacement of traditional devices with cloud-enabled technologies, fueling the data center networking market growth. The vendors in the market include Hewlett-Packard Enterprise, Arista Networks, Juniper Networks, Huawei Technologies Co., Ltd., Cisco Systems, Inc., Microsoft Corporation, and Dell, Inc. Companies operating in the global marketplace are required to invest heavily in R&D activities to aid in the launch of new products. Additionally, data center networking market players also tend to enter partnerships with other players for the improvement of their technologies. For instance, in June 2015, HPE had announced that it had entered into a strategic partnership with Arista Networks for the development of high-end switches. This move has aided both companies to gain a stronger foothold in the industry and has allowed HPE to become a more appealing alternative to cloud service operators providing outsourced space and services. The data center networking market is anticipated to gain traction at a very rapid pace as companies are increasingly moving to a more data and consumer-centric business model. The efficient operation of these structures relies heavily on the quality and technology of the network components owing to which these technologies are an essential part of the infrastructure with large and hyperscale facilities housing a very large number of components such as routers and switches that are interconnected with each other. The market is highly susceptible to changes in technology and the industry comprises a large number of players. Hence, there is an intense competition in the industry with companies undertaking strategies such as aggressive marketing plans, development of customer-specific products, and the increase in activities such as mergers and acquisitions. The high growth prospects of the market are causing more players to enter into the field owing to which the industry is rapidly approaching a mature stage.